child, the bag lady. They are all part of the life of this rural Recreation Ground. Come and do some people watching with us. and around Yorkshire, Cumbria and Essex. 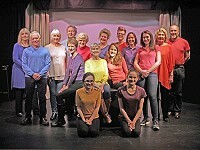 Jamesine is currently Artistic Director of Ilkley Playhouse.